Citation: Yilmaz Kara B*, Ozyurt S, MetinY, et al. A rare case of non-resolving pneumonia: Lipoid pneumonia. Biol Med Case Rep. 2018;2(3):1-2. Non-resolving pneumonia, Lipoid pneumonia, Aspiration. Lipoid pneumonia (LP) is defined as a clinical and radiological sum of abnormalities due to aspiration of oil-based foreign material to the lung. There are two kinds of lipoid pneumonia defined in the literature. Exogenous LP is associated with aspiration of oily material to the airways and finally the lung parenchyma consciously or accidentally as in fire-eater’s lung . Endogenous LP is a more complicated situation that occurs when an endogenous lipoid material fills the alveolar space without any history of aspiration. It is associated with certain conditions like bacterial pneumonia. The pathogenesis is similar to alveolar proteinosis . We report a case of non-resolving pneumonia finally diagnosed as exogenous lipoid pneumonia caused by aspiration of a liquid laxative. A 25-year-old female was admitted to the hospital with a history of a productive cough, dyspnea and loss of appetite for the last two weeks. She was disabled and bedridden due to cerebral palsy since birth. Her parents were responsible for her personal care. On admission, the physical examination revealed cachexia with a body mass index of 14.7 kg/m2. Body temperature was 36.7°C, pulse rate was 86 per minute and arterial blood pressure was 110/70 mmHg. Chest auscultation revealed right-sided coarse crackles more prominent over middle and lower lung zones. Examination of the abdomen was normal except diffuse tympanism. A chest radiograph showed nonhomogenous opacities compatible with pneumonia on the right lung (Figure 1). Figure 1: Chest X-Ray of the patient at initial examination showing infiltrates in the right lung. Biochemical examination showed no abnormalities. Acute phase reactant measurements were normal. Ceftriaxone plus clarithromycin was the treatment of choice for the patient’s community-acquired pneumonia. During the hospital stay the patient’s nutritional status was observed. Her mother was feeding her orally with normal food in semi-liquid form but during feeding episodes, occasional aspiration was witnessed by the health staff. The patient’s parents strongly denied aspiration. Feeding with a nasogastric tube or gastrostomy tube was recommended due to weak gag reflex but the parents refused. After five days of hospitalization, the patient was discharged from the hospital with an oral antibiotic therapy prescription. A control chest X-Ray was obtained and little or no change in the opacities was noticed during the control visit at the outpatient clinic. Thoracic computed tomography revealed lung infiltrates on the posterior segments of both upper and lower lobes of the right lung (Figure 2). Bronchoscopic examination was normal with no growth in aerobic cultures. Microscopy of the lavage fluid was negative for acid-resistant bacilli. A differential diagnosis of non-resolving pneumonia was necessary; therefore the anamnesis of the patient was deepened. Drug enquiry revealed long-term laxative use for chronic constipation. The laxative used was containing liquid vaseline which may be the cause of the patient’s clinical condition. Because of witnessed aspiration history, a clinical diagnosis of lipoid pneumonia was made. The responsible laxative was abandoned and follow-up of the patient was recommended. Figure 2: Thoracic computed tomography images obtained at the control visit. While making a differential diagnosis of non-resolving pneumonia, patient characteristics must be taken into account. In young patients, benign diseases like tuberculosis and vasculitis are the most common reasons while malignancies like the lepidic pattern of adenocarcinoma and interstitial lung diseases are more prominent in the elderly. Patients with chronic comorbidities are more prone to have non-resolving pneumonia with antibiotic-resistant bacterial origin. Bronchoscopic evaluation with bronchoalveolar lavage and mucosal biopsy is recommended while dealing with non-resolving pneumonia in order to rule out endobronchial pathologies . Sometimes only a more careful anamnesis and history taking may be adequate for making the diagnosis as it was in our case . In rare cases sputum cytology may disclose the hidden pathology especially when examined by an experienced cytologist , but usually, more invasive methods like a parenchymal biopsy or necropsy for certain diagnosis are needed. Lipoid pneumonia is one of the rare diseases causing non-resolving pneumonia. Clinical features may vary depending on the amount of aspirated substance. It may be presented with clinical features ranging from no symptoms to severe respiratory failure. There is no specific finding or biochemical measurement recommended for lipoid pneumonia diagnosis . Radiologic findings may include consolidation, ground-glass opacities, crazy-paving pattern or masslike lesions on thoracic computed tomography . Cytology may demonstrate numerous lipid-laden macrophages that are positively staining with lipid dyes like oil red O or Sudan black . There are no studies in the literature delineating the best therapeutic options for lipoid pneumonia. Antibiotics and systemic corticosteroids are recommended as well as therapeutic lavage . Lipoid pneumonia is a relatively uncommon disease-causing nonresolving pneumonia. It may mimic more common diseases like pneumonia, pulmonary fibrosis, and lung cancer. It should be considered as a potential diagnosis in patients with non-resolving pneumonia when a proper treatment does not yield expected clinical response. Załęska J, Błaszczyk A, Jakubowska L,et al. Fire-eater’s lung. Adv Respir Med. 2016;84(6):337-41. Hui CK. Endogenous lipoid pneumonia associated with legionella pneumophila serogroup 1. Singapore Med J 2013;54(3):66-7. Chaudhuri AD, Mukherjee S, Nandi S, et al. 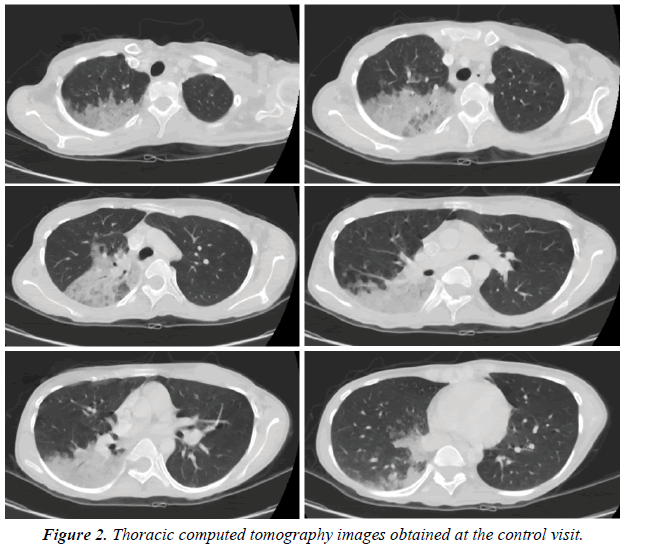 A study on non-resolving pneumonia with special reference to role of fiberoptic bronchoscopy. Lung India: official organ of Indian Chest Society. 2013;30(1):27. Simons SO, Braam EA, de Boer RC, et al. Non-resolving pneumonia in patient with obsessive-compulsive disorder. Thorax. 2014;69(2):193. Hanrahan L, Chotirmall SH, Nicholson S, et al. It is all in the sputum: a case of non-resolving pneumonia. BMJ Case Rep. 2014. Özyurt S, Karataş M, Gümüş A, et al. Lipoid pneumonia for two cases. Respiratory Case Reports. 2015;4(3). Latorre RG, Díaz RR, Barreto DB, et al. Exogenous lipoid pneumonia in laryngectomy patients: radiological findings. Archivos de Bronconeumología (English Edition). 2015;51(7):36-9. Kuroyama M, Kagawa H, Kitada S, et al. Exogenous lipoid pneumonia caused by repeated sesame oil pulling: a report of two cases. BMC Pulm. Med. 2015;15(1):135. Nguyen CD, Oh SS. A case of exogenous lipoid pneumonia. Respiratory care. 2013;58(3):23-7.